Immunogen: Synthetic peptide corresponding to the sequence near the C-terminus of human nNOS. Western blot analysis: Lane 1: MW marker, Lane 2: Rat Brain, Lane 3: Mouse Brain. 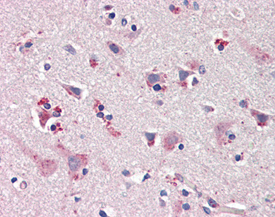 IHC Analysis: Human brain, cortex tissue stained with nNOS, pAb at 20µg/ml.